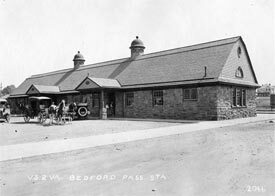 As in other small towns, Bedford's railroad station was the hub of community life. Transportation of passengers, freight and mail, from the railways' inception through World War II and the Industrial Revolution, meant that railroad stations were a vital part of both the local and national economy. In 1881, the Norfolk and Western Railroad emerged from a series of railway expansions and consolidations. Under its direction, Bedford's station enjoyed and suffered the same consequences as the rest of the nation's railways. These included economic booms and depressions, the effects of war, and finally, near-abandonment in the face of automobile and airplane travel. For Bedford, railroad activity flourished through the 1920's. The numerous passenger, freight and mail stops required 24 hour-a-day service. World War II found the station participating in transportation of troops, supplies and ammunition. 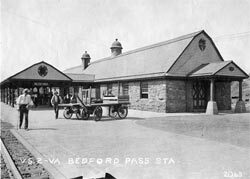 The revered Bedford Boys, the men of the 116th Infantry, left for service from this very station. Their patriotism and sacrifices have been honored and immortalized with the creation of Bedford's National D-Day Memorial. Passenger service was finally eliminated in Bedford in 1971. Since that time, the station has housed several different services, while trains carrying freight continued to travel the tracks. Our restaurant, Liberty Station, was established in 2001 as a full-service, locally owned and operated eatery. It, as part of Bedford's Centertown, is on the National Register of Historic Districts. Unfortunately, a fire in September of 2009 destroyed much of the Station. The stone walls, witnesses to 121 years of history, remained. 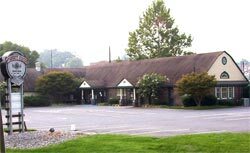 A proud and caring community offered help of every kind, and a remarkable team of craftsmen allowed Liberty Station to reopen in February, 2010. Today, more than ever, we are proud of our historic heritage, our community and our restaurant. Thank you for visiting us. We are pleased to serve you.